The wall might crumble without the capstone. Architecturally this is true.The capstone is one of the finishing or protective stones that form the top of an exterior masonry wall or building, and it is the perfect metaphor for the culminating 8th grade year at The Lexington School. The capstone experience at The Lexington School includes a rigorous pre-AP academic year, collaborative capstone research presentations, environmental debates, increased service initiatives, seminars in outdoor education, etiquette, health, and much, much more. It is a busy and fulfilling final year as TLS kids prepare to springboard into the fever pitch of high school, college, and life. The ceremonious etiquette dinner and dance, southwest trip, candlelight ceremony, advisor comment night, and finally commencement finish off the year in fearless Lexington School fashion. Which brings us to Commencement and Lee Kiefer ’08. 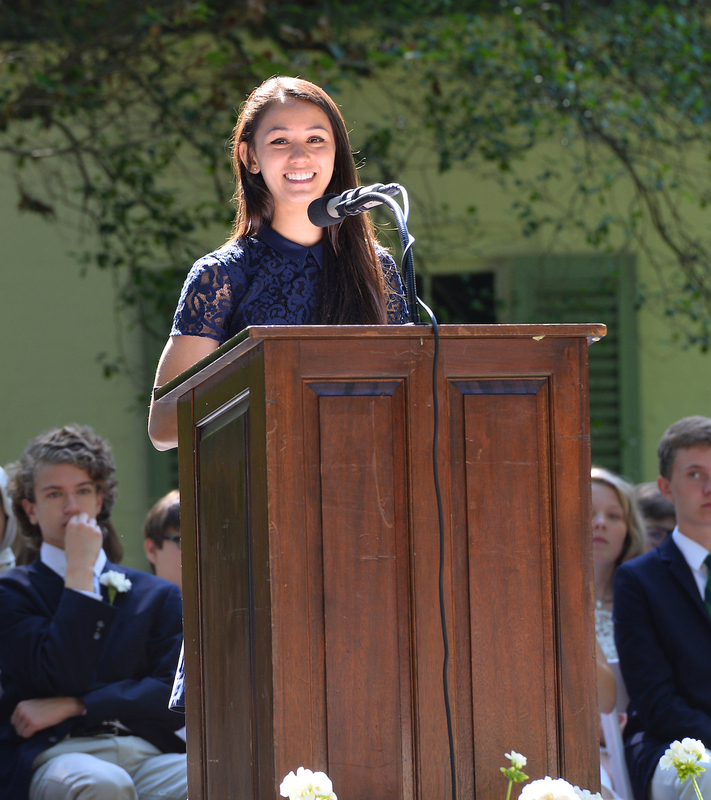 The capstone year ends with a commencement ceremony that celebrates The Lexington School student’s past, present, and future. Graduate leaders share their own experiences, and each year an esteemed alumnus addresses these teenagers as further example of what it is to be a Lexington School graduate and how to best maximize this worthy investment. This year Lee Kiefer ’08 was that worthy example. A quick Google search of Lee Kiefer ’08 gives you enough reading to last all morning – Number One foil fencer in the world, first US woman ever to earn that ranking. Two-time Olympian (London and Rio). Too many World Championship and Pan Am Games to count. At 15, she was the youngest member of the Senior World team. Two years later, winning the Senior World Championship bronze, she became one of only a very few athletes in the world to earn individual podium finishes in the Senior, Junior, and Cadet competitions. Just this May Lee graduated from the University of Notre Dame, where some say she “may well qualify as the most accomplished individual in the history of athletics.” In September, she’s headed to the University of Kentucky Medical School. Curious about what advice Lee has for the class of 2017? Read her speech below and/or watch her deliver it HERE. Thank you for having me on this fine day. It’s funny I’m here speaking for a few reasons. First of all, I remember my commencement in 2008: sitting on the stage in my white dress, slouching per usual, and listening to the speaker. As he talked on, one of the prevalent thoughts in my mind was “Wow, this guy is so old.” He was probably not even 30 years old, but here I am at 22, giving a speech, and, because I look younger than most of the graduates, you guys are probably the ones feeling like dinosaurs. The second funny thing is that I’m terrified of public speaking. Before last month, the last time I had to speak in front of a group larger than 50 people was my eighth grade talk. I understand eighth graders make Capstone speeches now. We had to prepare a topic in Dr. Blake’s class for months and then present in front of an assembly. During my talk on “laughing,” my voice was shaking, my armpits were dripping with sweat, and I blacked out halfway through. That experience was more anxiety-provoking than the Olympics. Competing in front of thousands of people, holding the hopes and dreams of my family and America was no big deal, but public speaking to this day is a struggle. You guys are lucky though, because I had a chance to practice a few weeks ago when I delivered a senior farewell speech to the Notre Dame fencing team. Each senior is required to spill their heart out to their teammates and coaches during the end-of-the-year banquet, reflecting on their past four years as a team member. After watching others do this when I was an underclassman, I was prepared to find an excuse not to attend the banquet. Unfortunately, I couldn’t manage to escape, but the speech making and delivery process gave me some food for thought and inspiration to bring here. The theme I want to discuss with you today is fear. Fear can be defined as a “distressing emotion that is aroused by impending danger in response to a real or imaginary condition.” There are going to be moments in your life where you are fearful or nervous about a situation you face or about something to come. Regardless if you are a student, teacher, or parent, you should welcome many of these moments as challenges. Because many of us here today have grown up at TLS since we were five years old, it is possible to say that we have all been placed in common situations that evoked similar emotions of fear. The France/Spain trip – I don’t know about you guys, but it is uncomfortable attempting to talk to strangers in a foreign language. A funny but slightly traumatizing example was when Dr. Cooper would yell at us in chorus or during practice for a school play because we were not singing or talking loud enough. Failing one of Dr. Bonzo’s papers. Enough said. Not knowing what high school I was going to attend and the uncertainty that high school held. Finally, mountain climbing, propelling, and other dangerous activities during the South West trip: being scared of heights or, more realistically, scared that one of your classmates was going to get hurt. For many of us, moments like these elicit fear, which is a very natural response to a threatening condition, but I believe that being conscious of the situation and conscious of ourselves makes it possible to evaluate what role this emotion should play in our lives. I ask you to resist the natural instinct to be scared of trying new things. Strange and uncomfortable experiences add to our reservoir of skills and enhance our knowledge of the world around us. It is okay not to know something; you only learn in those situations by asking questions and, most importantly, listening to the responses. Similarly, do your best not to be afraid or worried about other people’s judgments of you. Sometimes judgment can be petty and cause pain, but judgment can also make us better. It can remind us that we have room to learn. Listen to the people around you, but be confident in the person you are and the person you strive to be. Together, let’s talk in foreign languages with bad accents and sing out-of-key at the top of our lungs. Furthermore, try not to be scared to lose or fail. When I was in Rio, an inspiring weightlifter talked about the process of getting to the Olympic Games. He told us that “your life and your character will be reflected in the effort you put into every activity.” Even though he has an Olympic gold medal, his life is not driven by the fact that he won. What matters is the hours he spent training and the relationships he made along the way. A victory is determined by the hard work throughout the process, not the end result. So yes, it stinks to have a paper marked up in red, but with each draft, we are getting better. Despite your best effort, there will surely be moments when you are afraid. Most commonly, you may find yourself scared when you really want to do well at something you care about, and that is totally understandable. Although you should not obsess over the end goal, it is okay to want all of your work, sweat, and tears to come to fruition. This does not only apply to sports; we can put the same effort into academics, jobs, and forming meaningful relationships. It is right for you to care with all of your bones, so embrace these moments of fear and do not let them cripple you. Invest yourself in your daily and long-term goals to become your best possible self. There will be no regrets. It is also natural to be scared for the people you love. It is your parents and your teachers who have provided you with the foundation and the opportunities to face the scary situations in your life. If you have trouble putting in the effort for yourself, stay motivated for these people. Without my huge team, consisting of family, coaches, teammates, and teachers, I would not have been able to qualify for my second Olympic Games. I would not have been able to win five NCAA Championships at Notre Dame, and I definitely would not have been able to get in to UK, where I will attend medical school in the fall. It is with their help that this second I am talking in front of hundreds of people without feeling nauseous.… Or am I? In conclusion, many of the things that appear scary are just the things that will help you grow into a better version of yourself. Be grateful for the support of your family and friends who help you through your respective journeys, and moving forward into high school and beyond, place an emphasis on helping others face their fears. Thank you, and best of luck, Class of 2017! Thank YOU Lee for your amazing example and mentorship. Want to see what the final days of the capstone year look like? Here’s a full gallery of photos. Want to know where they go next?